Just a few of the many ways are listed below. From before Thanksgiving to after the New Year, the holidays are busy times for our families and the House. If you or your organization would like to help the House, please call! Purchase our holiday cards. Our wonderful holiday cards are typically available by mid-November . . . perfect for home or business use! A package of 20 is $10.00. As the holidays draw closer check this site for updates. Holiday cards are available while supplies last. Consider making a gift in honor of a friend or loved one. Does Aunt Ester really want or need another box of chocolates or monogrammed hankie? Wouldn’t she really love knowing that a family in need had been helped instead? 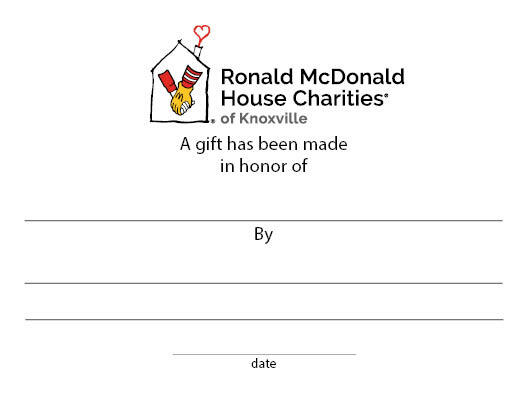 Your friend or loved one will receive this gift card noting that a gift to the House has been made in their honor. You will receive a tax receipt and the satisfaction of knowing you found the perfect gift. Goodies are so appreciated by our families. When baking those holiday treats, you could make an extra batch of cookies and drop them by. Everyone loves to nibble! It means so much to our families to come “Home” to our House after an emotional visit to the hospital to find a meal waiting for them. From mid-November to early January, donations of meals steeply decline. Everyone is busy! We’d love your help in providing breakfast, lunch, or dinner. From pizza to sandwiches or soup…it doesn’t need to be fancy to be appreciated. While we love to receive gift cards to supermarkets and discount stores year round, we especially appreciate them during the holidays for those last minute needs. Your home or business could download our “wish list” and collect needed items. Instead of a Secret Santa or white elephant exchange, bring a donation to our House. Even party guests you’ll be hosting could bring an item from our wish list to your soiree. A family’s unexpected medical expenses can make the holidays even more stressful. Could you or your company/group consider “adopting” one of our families to help provide some holiday cheer? Call us for details. Dillard’s is once again offering their exclusive custom edition of the Southern Living Christmas Cookbook for only $10. This ultimate holiday go-to source for recipes and decorations contains more than 250 recipes for seasonal gatherings, from breakfast and brunch to desserts and party-ready treats. You’ll find fresh inspiration for joyful mantels, doors, wreaths, trees, and tables with over a dozen delightful recipes for homemade gifts from the kitchen. The Southern Living Christmas Cookbook lives beyond Christmas.